I haven’t felt like writing recently but with the New Year approaching, I felt like it was time to pick back up for a bit. I use to be the kind of person that subscribed to the notion that New Year’s resolutions were the sort of thing that would help. The resetting of the calendar creates a time that seems perfect for starting anew. I would set goals of loosing weight, drinking less soda, not eating out as much, or saving money (the usual laundry list of traditional resolutions). Then I realized that a.) that was stupid and b.) hardly anything stuck. So instead, I started using this time to reassess the broader issues in life, mainly, am I happy and fulfilled? I told M yesterday that 2013 was the year of “no.” (and then I read this article which confirmed I was on the right path). I’ve realized that I’ve let many things go because I’ve been “too busy.” I miss reading, traveling, and spending time hiking. I’ve been infront of my computer nonstop for the past few months (starting a new business will do this too you, though- I just need better time management with this). The bottom line to everything is: am I happy? Because if I’m not, what’s the point of doing something? This past year has revolved around those two questions. I found that the career path I’ve been on isn’t the one I’m truly passionate about and I started making steps towards something new. I can’t express how grateful I am that through this little blog, I found the best business partner for which I could have asked. I think the business has far exceeded both our expectations. I’ve also been fortunate to pick up more and more freelance photography work, which makes my heart sing. And then there’s M. We had our share of ups and downs but I believe we needed to go through it all to get where we are today. He’s truly my best friend and every day we strive to make each other a better (happier) person. He’s been behind me 100% with all the crazy and not-so-crazy ideas I’ve had. And of course, I’ve been behind (pushing) him to make quite possibly the craziest move he’s ever made by moving to California. It all seems crazy but if wasn’t, life would be rather boring. I don’t think I’ve ever been so excited for a new year. I’m looking forward to seeing how the business continues to grow, the move to California, and of course, the wedding in September. I also think this year is going to be full of reading, hiking, dancing, singing, traveling, exploring, snowboarding, and cooking. It’s going to be a good (happy) year. 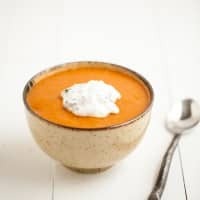 This soup is simple. I had an abundance of mashed sweet potatoes leftover from Christmas and I was quickly tiring of eating just leftovers. Of course, this is just as easy to make from a sweet potato too. 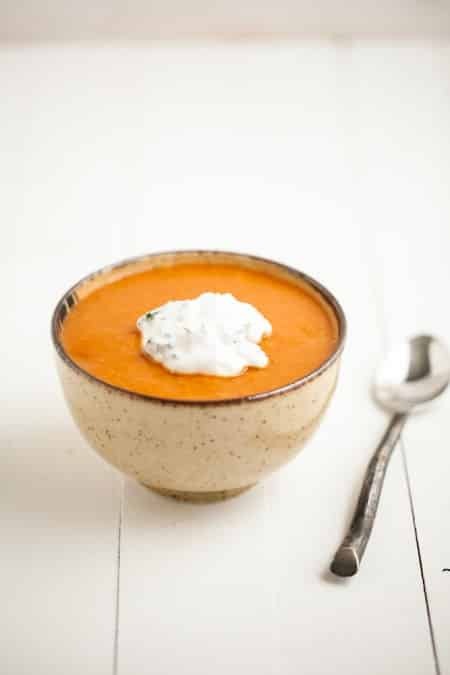 For an extra flavor, try roasting the sweet potato first and then pureeing it with broth (you may need a little extra than what the recipe calls for.) 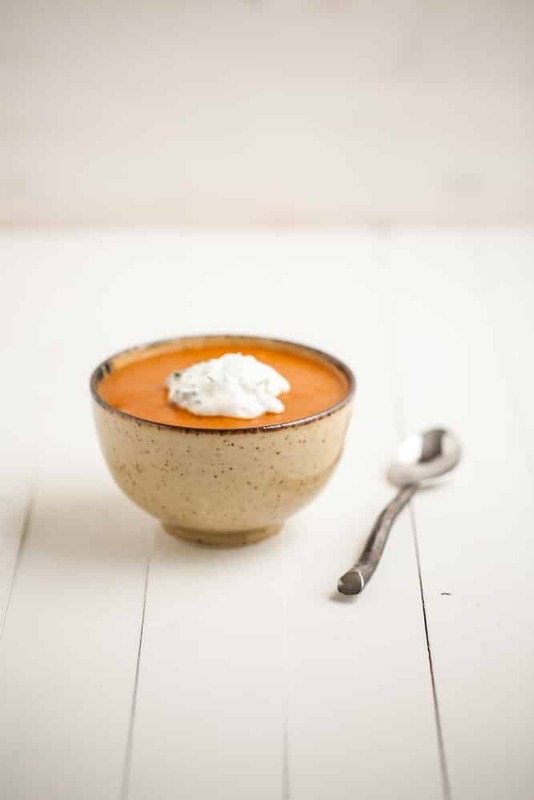 I’ll leave this soup a bit thicker and serve over rice- makes for a great, one-bowl meal. To make puree, peel sweet potatoes and cube. Bring a pot of water to a boil and cook potatoes until tender. Drain and to a food processor. Add 1/4 cup of broth and puree. In a pot, heat olive oil over medium heat. Dice onion and add to pot, cooking until tender, 6-7 minutes. Add in paprika, turmeric, salt, and pepper, cooking for 1 minute. Stir in 2 cups broth and sweet potato puree. Bring to boil, reduce to a simmer, and let cook for 10 minutes. Taste and adjust seasonings to your liking. Add more broth to reach desired consistency. Stir together greek yogurt, cilantro, honey, and lime juice. 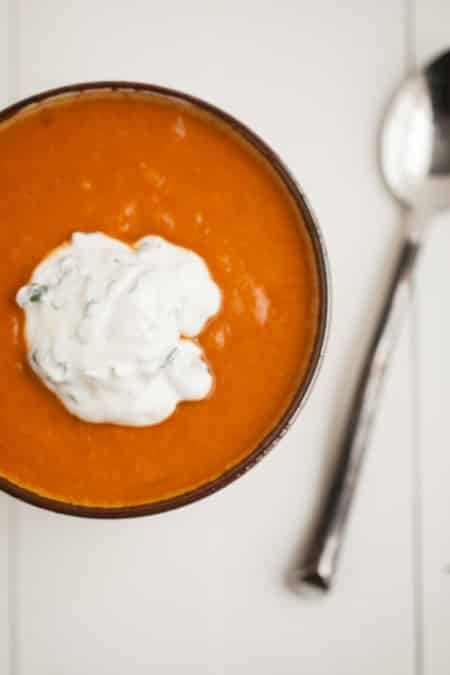 Pour soup into bowls and serve with a dollop of yogurt. Great post. It’s nice that you found a career that makes your heart sing. I can tell that you are passionate about what you do from your posts. Indeed it is a new year, and I wish you the best. This soup sounds fantastic! And the greek yogurt, lime, cilantro topping sounds super refreshing. Yum! Happy new year! Hooray! BIG fan of saying no. It’s certainly easier when there’s a reason for it (for you, the business … until recently, for me it was the book manuscript). I’ve been finding lately that with that finished, I’m having a harder time saying no so the trick, I think, is to figure out a way to say it authentically without a bigger external excuse/reason. Anyway, rambling. But the soup looks delicious and I’m excited to see what 2013 brings for you, the site, and the business. Yeah! Best wishes for 2013 Erin, I’m so grateful to have found your blog this year and I look forward to seeing what the next year has in store for you. I’m pretty sure it’s only good things. Hi Erin, I have been a reader for quite some time, but because of that dratted “too busy” thing, time never seemed to cooperate when it came to leaving comments on my favorite blogs. The irony of it all is that 2012 was *my* year of “no.” I distinctly told my husband at this time last year that I was going to say no more and reclaim those lost moments. This post resonated quite well! You can imagine that in 2013 I will be doing that more in earnest 🙂 For me, I will be returning to the blogging that I first fell in love with, and that includes making more time to visit. I just want to say here’s to an exciting 2013 for you! Also, I saw from Melissa that you will be at Alt Summit, I am really looking forward to meeting you. The soup looks fantastic. I love that vivid color. This soup sounds delicious! I also love the bowl in the photographs. Could you tell me where you got it from? Hi Stacia- I honestly have no clue since I think I bought it four years ago, but if I had to guess- World Market!